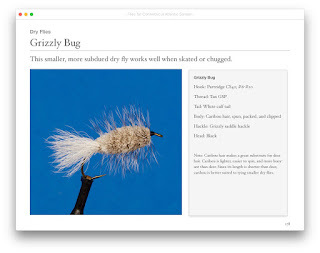 The Grizzly Bug is a very effective dry fly. From "Flies for Connecticut Atlantic Salmon"
October 11 was a late start for me. I had gotten in at 1:00am , so I didn't on the river until about 10:00am. Most of the action seem to happen that morning. My friend Bob was fishing by sunrise. He hooked two and landed one, both on streamers. I seemed to arrive at the tail end of the action. My first pass through the pool raised a salmon on a hitched tube fly. 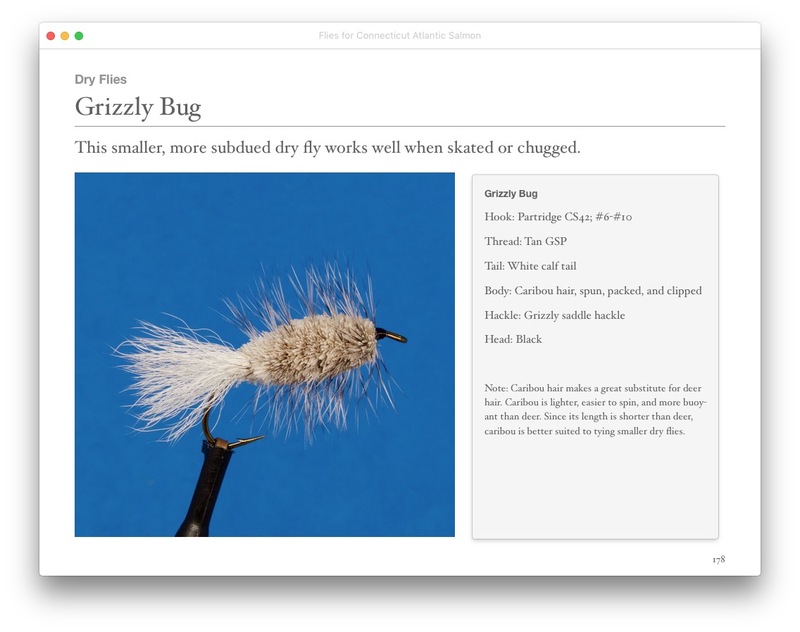 I rested the fish and tried a dry fly, the Grizzly Bug (pictured above). The salmon left his lie and tried to grab the fly. He didn't swallow it whole, but got enough of it in his mouth to feel the bit of the hook. I didn't hook him, but I freaked him out enough to not come back. I couldn't stay very long, as I had an early gig that evening. That was the extent of my action for the day. It was a very bright and sunny day with no clouds in the sky. The water had dropped back to around 80 cfs. Once the sun lit the pools, the salmon seemed to shut down. Despite a lack of action, it was fun to raise a salmon on surface flies. October 16 was the first day I was able to get out for a significant amount of time. I didn't take the water temperature, but it definitely felt cooler. I would guess it was in the mid to upper 50s. The water is as low as I've ever seen it, around 70 cfs. I saw a few fish that morning, but couldn't get a grab. It was very windy early in the day and the river was filling with leaves. Fortunately, the strong winds died down eventually. I moved to my confidence pool and was happy to see it unoccupied. After prospecting with a blue Bomber, I made my way to the top of the run and tied on a sz. 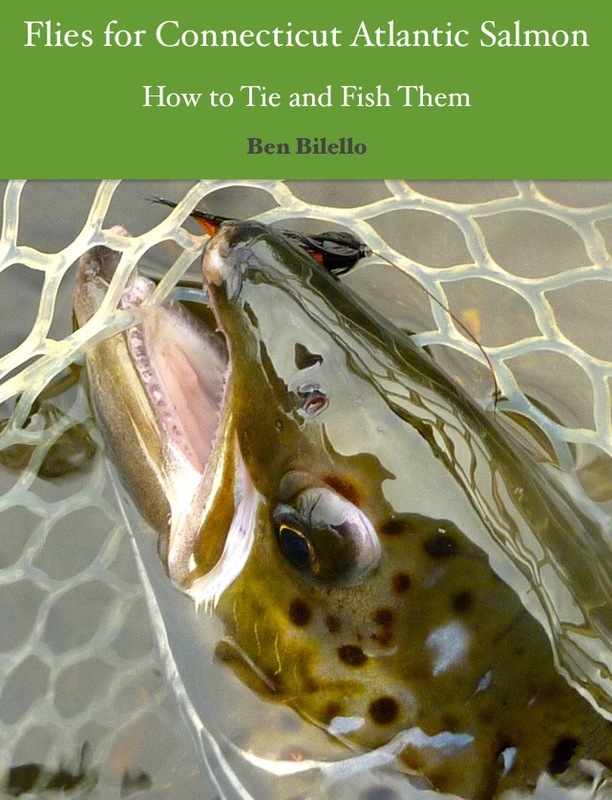 10 Almost, a great fly for when the salmon feel skittish. Within five minutes I was tight to a salmon. It wasn't an explosive fight, but it lasted a lot longer than I thought it would. The fish seemed sluggish at first, but starting turning on the longer the fight went on. He made three strong runs, but only jumped once. I dropped my net, so I had to tail him. It is very difficult to tail salmon under 24" or so. This one was around 28" and 7-8 lbs., so tailing him was not a problem. Since my net was lying on the bank far upstream, I didn't get picture, preferring to get this guy on his way as quickly as possible. Other than catching a holdover rainbow trout on a black Snaelda, that was the end of the action for me. I left earlier than I planned, around 5:00pm. This low water is frustrating. It is difficult to get into a rhythm when swinging wet flies. The flow is so anemic, most of the better runs can be adequately covered in under 10 minutes. Normally, some of these runs would take 30-45 minutes to fish. It is very frustrating. To make things more fun and interesting, I am making surface flies a priority for now and am fishing mostly hitched tubes and dry flies. We'll see how that goes. Nice going Ben, glad to hear you are getting out there! Naugatuck Report - October 20, 2015 - Adrenaline!